It doesn’t matter whether you have only been in business for a short while, or whether you are looking to expand, drowning in paperwork is a common problem no matter where you are in your journey. You may know you need help with your admin and marketing, but taking the next step is a little more daunting. 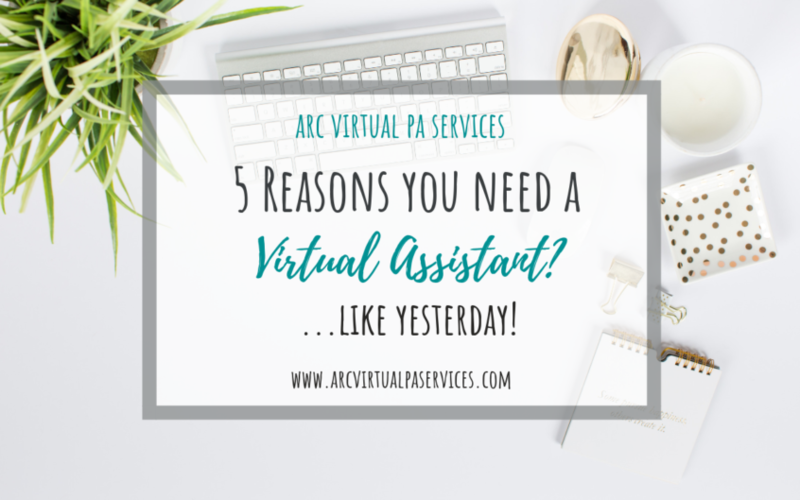 Worry not, I’m here to help with some important reasons as to why you need a virtual assistant… like yesterday! The majority of virtual assistants are also small business owners, so we feel your pain. We understand the frustrations of running our own business while still finding time to spend with family. We have to manage our client’s work as well as promoting our business, processing payments and making the tea. Because of this we can also be a useful sounding board if you’re having problems and want to offload to someone. Since virtual assistants are freelance, they don’t incur a lot of the charges an employee does. Yes, it may seem like our hourly rate is high in comparison, but we aren’t paid holiday or sick pay and you don’t need to pay tax or National Insurance. Another way to look at it is if you charge £75 an hour and find yourself spending your own time on mundane admin tasks, then you are losing out by not paying someone £25 an hour to do them for you. If you only need someone for 5 hours a month, it could be difficult for you to find someone to do the work. However, virtual assistants work on an as and when basis. If you find yourself needing more hours at certain times of the year, then we are on hand to help. We have the flexibility to fit in around your requirements, and better still, you only pay for the time you need. Virtual assistants specialise in anything from general admin to marketing, to website design and tech support. No matter what needs to be done, you will be able to find a virtual assistant to help and we’ve done it before and don’t need any training before we get started. Remember the enthusiasm you had when you started your own business, we can help you find it again. We can give you time in your day to spend on that part of your business that made you start up in the first place, the part of it you love! And by doing this your business will grow and thrive, like it’s supposed to. I’ve you’ve read this, and your first thought was “I need a Virtual Assistant”, then get in touch. I’ve love to chat about your business and chat about how I might be able to help.